Doors Open In. Left door is daily access door. Doors Open In. Right door is daily access door. The Supreme Grey 1.8m (approx 6ft), full aluminium French doors are designed right here in the UK and manufactured in our purpose built production facility to the same high quality as all Vufold doors. This sleek, premium aluminium French doors and frames are thermally broken for improved insulation and are ideal for those wanting something totally stylish yet resilient. 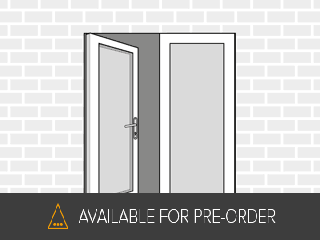 These Supreme 1.8M grey doors are 70mm thick with high spec triple glazed units making this door set both efficient and environmentally friendly. For maximum security they have a multi-point locking system which includes twin deadbolts in the upper and lower positions on the main access door that passes the rigours of PAS 24 and the forthcoming EN14351-1 2006 security standard. Also, they have extra twin point security bolts which are operated by a handle on the inside. Supreme French doors incorporate unique Vufold manufacturing techniques to allow the glazed units to be factory installed including the 'toe and heel' balancing. This enables really fast and easy installation by any competent DIYer or builder in easy steps. 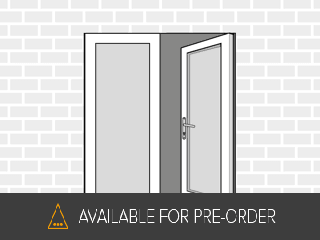 Each 1.8M Supreme French doors includes everything you need - doors, frames, hardware, handle, tracks, fixings, door stop and easy to follow assembly instructions plus the usual easy Vufold adjustability up to 8mm in height and 10mm in width. Stunning external bifold doors and casement windows are also available to perfectly match these French doors and complete the look on an extension, renovation or new build home.